NRITYOPASANA showcases the recent choreographic works of Guru Geeta Chandran, and includes a new Pushpanjali and a Tanjore Quartet Varnam in Kamboji ragam. MADHURA BHRUSHUNDI has been learning Bharatanatyam under the tutelage of Guru (Padmashri) Geeta Chandran for the last 10 years. She presented her formal debut solo performance, the Arangetram in the year 2014. As part of the Natya Vriksha Dance Company, she has performed in group choreographies at many prestigious festivals in India, the Youth Festival, organised by Sahitya Kala Parishad, Ganga Mahotsav, Uday Shankar Choreography Festival, to name a few. In October 2017, as a member of the Natya Vriksha Dance Company, Madhura travelled to Chile and performed at different venues across the country in celebration of 70 years of India independence. As a solo performer, Madhura has had the opportunity to be a part of various platforms such as the Delhi International Film Festival, FACE India International Women Leadership Awards and so on. Madhura has also assisted her Guru for SPICMACAY lecture demonstrations and workshops at various schools and colleges across India. 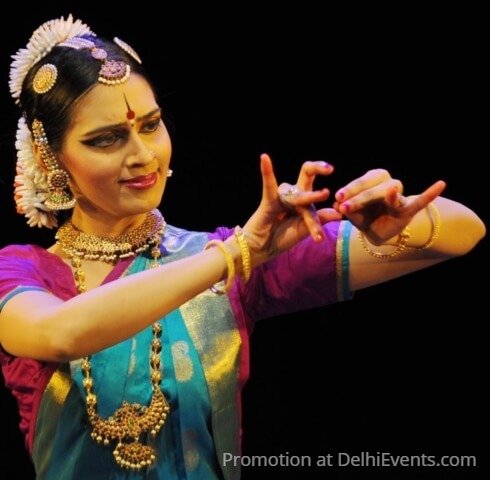 Apart from passionately pursuing dance, Madhura has also had an excellent academic record. She completed her bachelor’s in Economics from Hindu College, University of Delhi and an M.Sc. in Economics from the University of Warwick, U.K.